Big congratulations on your appointment to the highly esteemed position of the Minister of Information and Culture of the Federal Republic of Nigeria. It’s a well-deserved call to the governmental 'dining table' after 10 staggering years in the opposition as a Publicity Secretary. I have to admit I am a strong supporter of the 'Change mantra' of the All Progressives Congress, APC which constitutes the ruling party in Nigeria. I participated in series of social media activism and political campaigns in favour of your party out my love for Nigeria and strong belief in the promises of your party. I lost hope in the administration of former President Goodluck Ebele Jonathan due to my perceived zero plans for Nigerian youths as evident in the over 60% unemployment rate in Nigeria and the accelerated growth of political corruption which made the future of this great country, Nigeria bleak. I applauded the tactics you employed against the People's Democratic Party, PDP during the election campaign period which many term as 'propaganda'; whichever way, that was a viable seed you strongly planted in the loamy soil called the social media. Hence, the massive sprouting effect. I told some of your critics that politics is dirty and the issue of a clean fight is a mirage. If the great American boxer, Mike Tyson could stoop so low to bite the ear of Evander Hollyfield in the boxing ring, in the spirit of a bitter contest; then much is expected of politicians who are conventionally 'dirty and desperate' especially in the African circle. I personally learned from your doggedness and optimism which beat your opponent, Olisa Metuh who is the scribe of the opposition party at virtually all instances. Dear Sir, realities seem to have changed now. After every competitive contests, competing players exchange pleasantries in the spirit of sportsmanship. You are now the Minister of Information and culture which many term as a 'prebendal act' from President Muhammadu Buhari after your stellar performance in the course of your contributions to the success of the party at the general elections. You are invariably the mouthpiece of the Federal Government sir. This demands a civil and conscious approach to issues of the fate of over 170 million Nigerians. Despite your background in Public relations both on paper and in experience with reference to membership of the Nigerian Institute of Public Relations (NIPR) work experience as Public Relations Officer for almost 10 good years with the Nigerian Airport Authority, now Federal Airport Authority of Nigeria (FAAN); its written in black and white that you are struggling to adapt to your current status as a Minister. The uncivil attacking style of a political party's Publicity Secretary seems to have clouded your approach to state issues. The lady in question burst into laughter too. This speaks volume of a new word in the Nigerian street dictionary as your name is being used in place of unconfirmed reports or unfounded claims. This concides with Sambo Dasuki's name being used side by side with unwarranted instant blessings or corruption while Godsday Orubebe's name is associated with a disgraceful public outburst or rant courtesy of his unruly confrontation of Professor Attahiru Jega, the former Chairman of the Independent National Electoral Commission, INEC during a national proceeding keenly observed by the international community. Sir, I have followed the highlights of your unguarded statements and unfounded claims since May 29, 2015 when Buhari was inaugurated as president. It has been shameful to me that the APC have covertly being making U-turns on some cogent campaign promises which have being followed with series of disclaimers that have tainted the image of Nigerian journalism. 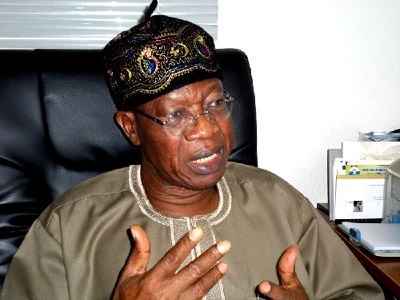 When the APC promised N5,000 palliatives for unemployed Nigerian youths, the people who have been plunged deep into poverty celebrated the initiative only for you to claim the fund is for ''vulnerable Nigerians'' The truth is, who is not vulnerable among the 110 million Nigerians stricken my poverty? When fuel scarcity hit Nigeria nationally in November, 2015; your unusual quietness for a period of two weeks was shocking. The prompt counter-attack approach you employed during the general elections dramatically went cold. I was embarrassed. A friend of mine who is a 'wailing wailer' according to the Special Adviser to the President on Media and Publicity, Femi Adesina categorically told me Lai Mohammed is virtually lame without propaganda, I.e. it takes controversy to feel your media prowess. I really don't want to believe that even though all indications support his claim. Sir, we longed to hear from you as the fuel scarcity was flanked with acute power issues that hit Abuja the federal capital not to talk of the other states. Sir, instead of speak for the Federal Government in the office language like we have in developed countries, all we read were catchy Newspaper headlines like your attack on the controversial Governor of Ekiti state, Ayodele Fayose on the Remitta issue that allegedly required N25 billion payment for a single financial operation on the Treasury Single Account. The general public are hoping on you for answers to the questions of uncertainties befalling the Nigerian masses and all you do is refer us to the previous administration of the past when we live in the present. You comfortably blamed the fuel scarcity on Goodluck Jonathan. You reiterated that Jonathan didn't make adequate provision for fuel subsidy in the 2015 national budget, that the new regime inherited vandalised pipelines and that out of the 674 billion supplementary budget of 2015 presented before the senate, N522billion was for arrears of fuel subsidy which was incurred as far back as August last year by the Jonathan-led administration. Nigerians are tired of fruitless blame games that only profit the media in boosting sales. We are more concerned about solutions and a repair of the damages caused by the 16 years of the PDP slavery if I am to borrow your words sir. Due to time factor sir, I will like to make reference to a recent blunder you made on the eve of Christmas while addressing the BBC which was unwarranted. This is on the December, 2015 deadline set my President Muhammadu Buhari to end the menace of Boko Haram insurgency in Nigeria. Virtually 4 days ago, you boldly stated that the current administration has met the set deadline to end terrorism in Nigeria which was highly laughable. As usual, social media reactions trailed your words. Fayose advised you to relocate to Sambisa forest in Borno state or Yobe state without the company of heavy military guards to ascertain if Boko Haram was still in existence. Sir, I can bet my life that Boko Haram would have abducted you even before your arrival. I saw photos of you doing physical exercises with the Nigerian troops led by the Chief of Army Staff, Lieutenant Colonel Yusuf Buratai in Borno state. The pictures were adorable as your tour round the newly acquired territories was like a needed vacation. I am pretty sure you allowed the heavy military guard you enjoyed to cloud your reasoning that Boko Haram has gone extinct. A critical assessment of your claims will show some elements of truth. It’s true that Boko Haram in the past month hasn't made any ''meaningful attack'' using your words but sir, permit me to say every life is important to the state. It’s the duty of the government to secure the life of every Nigerian citizen. Your action can be likened to a footballer celebrating a penalty kick that is yet to be converted. Your statement of victory against the sect has endangered several lives sir. It has caused a last bite of a dying dog. Boko Haram found it confrontational and since the statement hit the headlines, Boko Haram has been fighting extra hard to paint you a liar. This has led to renewed attacks in the North-eastern part of Nigeria. On the 25th of December, suspected Boko Haram members attacked Kimba village in Gur ward of Biu Local Government Area of Borno State. Reports have it that over 14 people died. A male suicide bomber who disguised as a female was also nabbed in Billiri, Gombe state by civilians out of sheer luck on Christmas day and a massive tragedy was averted. village head in Bakasi layout of Maiduguri claiming she was being chased by Boko Haram. The family of 10 children, 3 wives and two others that gathered to assist her were annihilated as she detonated a big bomb. Yesterday night, the insurgents were repelled by soldiers as they tried to enter Maiduguri via Aladuwari village, which is about 2 km from the Borno capital, according to reliable reports. The gun duel between the Nigerian army and Boko Haram insurgents which started around 6pm lasted for hours with several casualties including civilians who were allegedly hit by a Rocket Propelled Grenade, RPG. During the exchange of gunfire, two suicide bombers believed to be females, detonated explosives near a FOMWAN primary school between Suleimanti and Jiddari area of Maiduguri with massive casualties which the military has denied. Unconfirmed reports also have it that 25 persons were killed in a fatal suicide bomb attack at a mosque around Polio-Morioa in Maiduguri this morning, 28th of December as the faithfuls observed their early morning prayers. On the other hand, approximately 30 people were feared killed while 16 others injured in an attack by two female suicide bombers at a busy motor park in Madagali town of Adamawa State today, 28th of December. The sect leader, Abubakar Shekau or any other faceless frontman seems infuriated by your words sir. Compare the enjoyable silence of the sect before that quick utterance of yours to the current ressurgence of the sect. Even Buhari admitted that he had plans to convince the remaining members of the sect to lay down their arms for peace to reign in the country which is feasible. Sir, permit me to put it to you that your 'careless statement' has put the lives of civilians in the north-east as well as soldiers at risk. I know you were desperate about mocking the critics who never saw the December deadline as attainable but even your political opponent, Olisa Metuh withdrew his criticisms on the deadline in order to prevent undue pressure on the Federal Government to endure the Boko Haram insurgency. Metuh melted my heart when he backed Buhari to end terrorism in the north-east as Boko Haram is not only an enemy of the PDP and APC but Nigeria as a whole according to him. Fear is current gripping my heart as I conclude this piece because the next couple of days towards the end of this year will be fierce for the Nigerian troops. There will be sleepless nights in the camp of Boko Haram to make a mockery of Buhari and make a statement of relevance. "Let me emphasise that the time frame given should serve as a guide and if exigencies of multiple operations across the country requires modification, the Federal Government will not hesitate to do so in order to address the flash points that are emerging in parts of the country'' has already taken care of any agitations concerning a failed deadline as you pre-empted. Your recent 'Lai' was virtually unnecessary. I hope you will be able to find adequate sleep at night and gladly swallow morsels of pounded yam laced with bushmeat in the comfort of your mansion in Abuja with the rising death toll from several attacks in Maiduguri, Borno state.